A crew of about 50 people, consisting of Commission staff and volunteers, equipped the sheep with monitoring devices after a helicopter capture crew caught them at five locations in the Panhandle this weekend. The crew set up its mobile staging station at four locations along the Pine Ridge near Crawford and Chadron in northwestern Nebraska, and one site at the Wildcat Hills along the North Platte Valley near McGrew. In all, 51 sheep were captured – 31 in the Pine Ridge and 20 in the Wildcat Hills. In the Wildcat Hills on Saturday, 20 ewes were captured and equipped with radio collars. 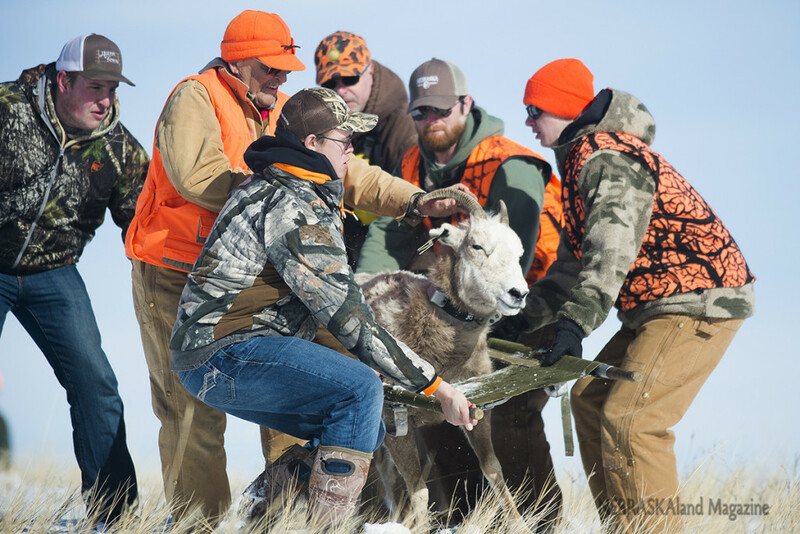 In the Pine Ridge on Sunday, 30 ewes and one ram were captured and collared. Most of the sheep received GPS tracking collars — an upgrade from the VHF models that have been used on the majority of the sheep in the past. Todd Nordeen, big game research and disease program manager for the Commission, said the GPS models will allow for remote monitoring via satellite and provide valuable habitat use data while still providing VHF capabilities for locating the sheep with telemetry equipment while nearby. 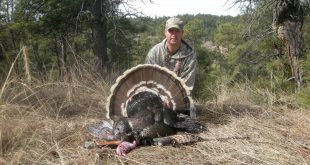 Herds in the Wildcat Hills have done well, but the Pine Ridge has not been so fortunate. This marks the second year of the lamb collaring project in the Pine Ridge, where no lambs survived in 2016 or 2017. In order to collar the lambs, a special device is used. 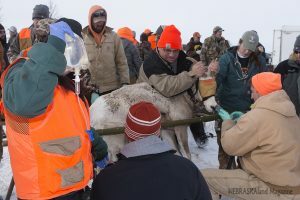 Twenty-five of the Pine Ridge ewes captured Sunday, which an ultrasound machine showed to be pregnant, were also given vaginal implant transmitters. The VITs, as they are called, are placed in the birthing canal to later be expelled the moment a lamb is born. With close monitoring during the lambing period this spring and early summer, Commission staff will race to capture and collar the newborns within 48 hours of birth. Any longer than that, they become much harder to catch in the rocky terrain. The ewes carrying VITs represent about half of the female population in the Pine Ridge. This year, the lambs will be given antibiotics to bolster their chances of survival and hopefully develop a class of animals for reproduction. Nordeen said the Pine Ridge herds are in jeopardy of being lost if the lambs keep dying. Although tissue samples have determined that the sheep are dying from pneumonia, there is still much mystery about the exact culprit causing the malady. Through continued research, the Commission hopes to find the answers to the species’ survival. Nordeen said the capture project and other research could not happen without the support of landowners who provide access for captures and monitoring, and the numerous other groups and organizations that provide financial and volunteer assistance. They include the Henry Doorly Zoo, Lincoln Zoo, South Dakota State University, Nebraska Big Game Society, Chadron State College, Crawford Companion Animal Clinic, Alliance Animal Clinic, USDA, Iowa Chapter of the Foundation of North American Wild Sheep and the Wild Sheep Foundation. A hunting season that occurs in years that enough older rams are present to warrant it also funds the research. In those years, hunters who win permits by lottery and auction harvest a total of one or two older rams. 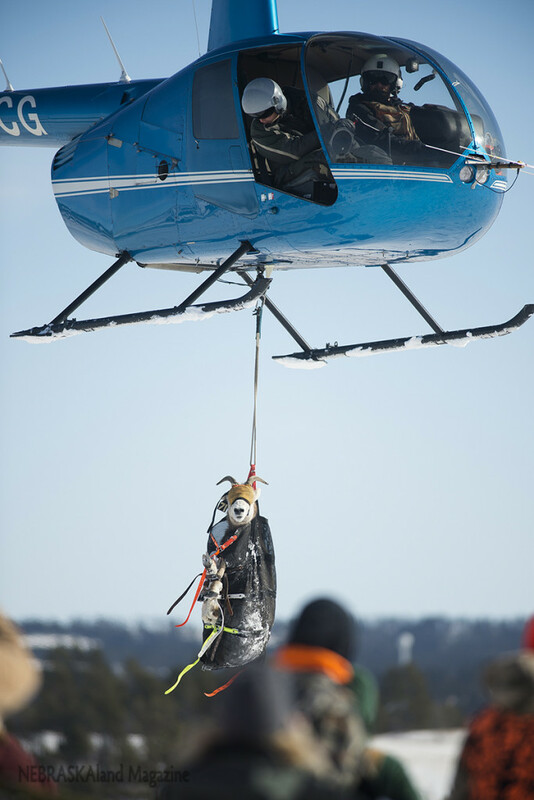 Previous Catch & Release on Ice, Do It Right!